Diving in Malta is an all year round sport, this is possible because of the great weather. The Mediterranean waters surrounding the Maltese islands are some of the cleanest and clearest seas you have ever see. There are intriguing caves, a variety of natural and artificial reefs, diving direct from the boat and a lot of different ways to go diving. Besides that are the diving schools very professional. Diving in Malta is a must. Diving in Malta is a unique experience. The water around the rocky islands offer a clarity and calmness that is almost nowhere else found. 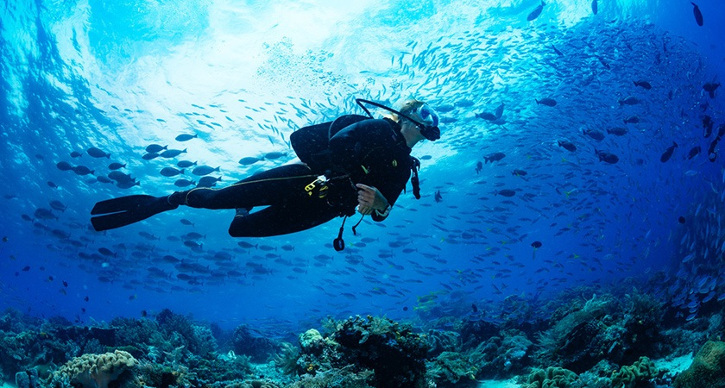 Especially scuba diving is very popular almost all year long. The different areas around the island offer challenges to beginning divers and the most experienced ones. From the 12-metre Għar Lapsi dive until 50-metre deep underwater tunnels. The fact that Malta offers diving locations for every kind of diver, makes the island popular amongst divers. Apart from that, the sun and the warm water make a diving experience the ultimate escape. Malta has a lot of favorites. But don’t forget about Malta’s beautiful sister: Gozo. You can find one of the most popular diving sites on the west coast of this cute island. In the Blue Hole you will find one of the most beautiful spots. Make your way through the crevice while you enjoy a meet and greet with several octopuses and lobsters. On Malta you will find some great spots around Ċirkewwa. Make your way down to the famous Madonna statue on 60 feet. In the beautiful Ramla Bay Resort, at Marfa Bay, you will find the Orange Shark diving center. Jump aboard for an unforgettable experience.